The spot between Dean Ambrose and Seth Rollins on the May 1 edition of Monday Night Raw was all fun and games until The Lunatic Fringe spoke those words. The moment was quick; it was so quick that it could have been missed by the casual viewer. But for fans that know The Shield’s history, the moment opened old wounds. Moments like that one do nothing but add realism to the product, and realism is something that’s been sorely lacking from WWE. Far too often the talent takes to social media in a seemingly concerted effort to demolish kayfabe. Not only are the men and women of WWE extremely good at doing just that, they’ve practically become experts at it. Just when fans think it couldn’t get any worse, it does. The fictional reality of pro wrestling takes a backseat in favor of the WWE Superstars letting their hair down and just loving life. Fans never asked for that, and many don’t want it now. But that’s what they’re getting whether they like it or not. But when Ambrose looked at Rollins and not so subtly reminded him of the betrayal that took place back in 2014, fans suddenly forgot reality and were immediately sucked back into the drama before them. It was a possible bit of foreshadowing, a hint of things to come. Surely the time will come when Rollins and Ambrose will revisit their feud, and this time Rollins may be the man left for dead in the ring. Their backstage spot did indeed blur the lines between fiction and reality. Fans know that almost everything in WWE is choreographed, and that everything is predetermined. But when it comes to one of the most popular factions of all time, there’s still an underlying tone of believability that exists. In other words, it’s a situation in which fans can say they know the business is a set-up, but that moment in particular? That’s real. The WWE faithful have wanted a Shield reunion from the moment that Ambrose, Rollins and Roman Reigns split up. The Shield was just so good, so strong, so over, that another run would be a guaranteed hit and a license to print money for WWE. But The Shield was more than just the latest trend in Vince McMahon’s company. The Shield harkened back to a time when groups like The Four Horsemen banded together for the love of the business. It wasn’t about holding anyone down. It wasn’t necessarily about getting rich. It was about having the best match on the card, and getting over in the process. That’s what The Shield was, and that’s what the fans miss. But all good things must come to an end of course and the same was true for The Hounds of Justice. The Shield was formed to develop and build three new main event stars, and when that goal was close to fruition, WWE pulled the plug and sent them on separate paths. Rollins was the first to realize his potential, and his heel turn was the perfect touch. Rollins sold his soul to Triple H in order to become The Guy, and it worked. Hunter delivered on everything he promised, and Rollins became a bigger star than he ever had been before. Reigns and Ambrose followed, and before long, The Shield alumni were running WWE. But that was the plan all along, which is perhaps the biggest reason why The Shield was the most successful faction of the modern era. They worked hard, they connected to the fans, and they accomplished their goals. The Shield clicked on every level. Of course fans still want to see the trio back together. It’s bound to happen eventually. However until it does, it’s obvious that Ambrose’s character holds a deep-seated resentment toward Rollins. After all, Seth destroyed the brotherhood. He took the trust that Ambrose and Reigns had in him, and he threw it back in their faces. Rollins went into business for himself, and he sold out his best friends for 10 pounds of gold. Rollins was a selfish backstabber whose arrogance took over, and in the end he paid the price for his sins. But the resentment is still there. Even fans who now cheer for Rollins likely wish they could erase the history books and forget about the night The Shield imploded. It was a shocking moment, one that still reverberates through the WWE Universe. It was beyond belief, and it was the end of an era. It was also great television. That’s what the fans want from WWE. It’s what they’ve always wanted. They want realism. They want to connect to the program; they want to feel every part of it down to their core. When an angle hits home and when it’s emotional, that’s when the fans lose themselves in the product. The spot between Ambrose and Rollins was brief, and in the end it may or may not, result in anything further down the road. 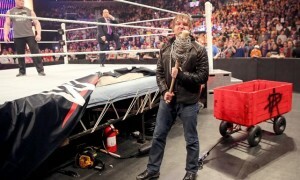 But it proved that Ambrose can be very good when he wants to be. It also proved that WWE still has the ability to pull fans in when it counts.